"Yummy and good anytime. These butter cookies are flavored with almond liqueur and can be rolled in any type of nuts before baking." In a medium bowl, cream together the butter and 1/2 cup confectioners' sugar until smooth. Stir in the flour and salt until well blended, then mix in the amaretto liqueur. Fold in chopped almonds if desired. 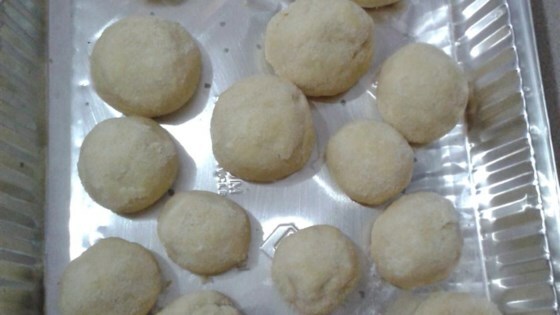 Roll the dough into walnut sized balls. Place the cookies 2 inches apart onto the cookie sheet. Bake for 8 to 10 minutes in the preheated oven. Allow cookies to cool on baking sheet for 5 minutes before removing to a wire rack to cool completely. Roll cookies in remaining 1/2 cup confectioners' sugar while still warm. I am sorry but these "cookies" were terrible. Lack of sugar was most noticeable. I followed recipe to a "T" and was greatly disappointed and threw them in the trash. These are pretty good, but really they could pass for sugar cookies. If I make them again I'll add more amaretto. These are my new favorite cookies! Absolutely AWESOME!!! I made these for Christmas and there were none left and everyone asked me for the recipe!